1) Take a look at the yellow right triangle on the left. Write an equation that expresses the relationship among angle B, the triangle's height, and side c.
2) Rewrite this equation so that height is written in terms of side c and angle B. 3) Now consider the pink right triangle on the right. Write an equation that expresses the relationship among angle C, side b, and the triangle's height. 4) Rewrite this equation so that height is written in terms of side b and angle C.
5) Take your responses to questions (2) and (4) to write a new equation that expresses the relationship among C, B, c, and b. Write this equation so that C and c appear on one side of the equation and that B and b appear on the other. 6) Now drag the slider in the upper right hand corner. Now, given the fact that the length of segment BC would be denoted as a (it's just not drawn in the applet above), write an expression for the area of this original triangle in terms of a, b, and C.
7) Same question as in (6) above, but this time write the area of the triangle in terms of a, c, and B. 8) Suppose that dragging the first slider dropped a height from point C instead of point A. 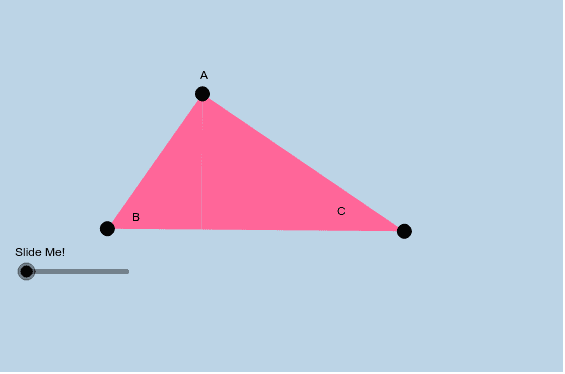 Answer questions (1) - (5) again, this time letting c serve as the base of this triangle (vs. side a). Notice anything interesting in your results?